Today I am so excited to be a part of the Hero Arts Blog Hop. The new release is amazing. For my card I decided to use the Newspaper Print Bold Print background. I used several different colors of Distress Inks to stamp my image. Then I went back and sprayed my stamp with water. I let the lid of my MISTI slam so the water would slap onto the paper. After I dried the paper, I ink blended with the same Distress Inks. 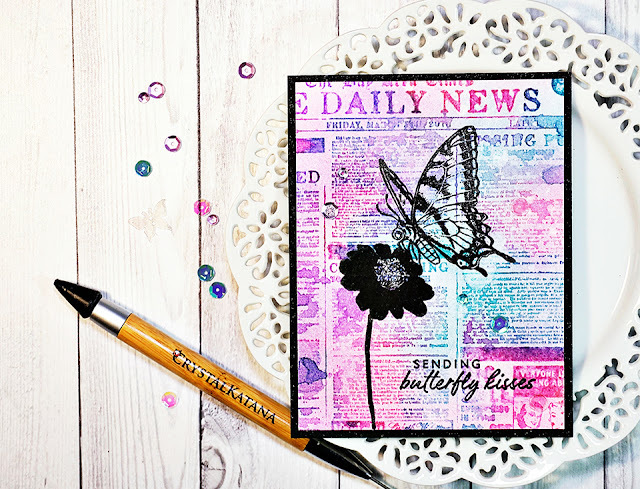 I used my Hero Arts Layering Swallowtail to stamp my focal image. 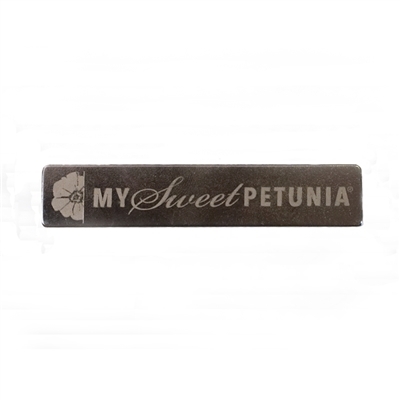 Because I used Versafine Onyx Black ink, I was able to add clear embossing powder and heat set it. Be sure to leave a comment on each blog listed below for your chance to win one of THREE $50 shopping sprees to Hero Arts. The deadline is February 22, 2018 at 11:59 PT. The winner will be announced the following week on the Hero Arts Blog. Your next stop is Emily Midgett. Don't forget to watch the video below. Thanks for stopping by! Wow!! I lovve this card!! So pretty! gorgeous...love your mix of stamps and the colors your used! Thank you so much for sharing your card I love it!! I love your background for this beautiful card. What a beautiful card! I love your background! I’m really loving this new stamp Newspaper print by Hero Arts. Thanks for the video showing how you achieved the multi colored background. The card is so simple and yet full of life. Thanks for sharing! Wow, I really am loving this new stamp Newspaper Print by Hero Arts. Thanks for the video, showing us how you made the multi colored background. Love how simple this card is and yet so dimensional. Thanks for sharing. Blessings on your day! I really love the colors you used... and what a great idea for the background...thank you! This is beautiful Iliana, a wonderful technique on your background. Love that stamp and the idea for a new technique. What a pretty card. Thanks for the ideas. Pretty, pretty card!My list of Must Haves is growing by leaps and bounds! Already have the swallow tail set on my list. I love the ink blended look. Thanks for sharing! Video is awesome. That background stamp is amazing! I can think of so many ways to use it. I love the colors you used as well. Great card!! I haven't seen mixed media style cards in a while. You made it really beautiful and elegant. I love it! Love the card and the video! So colorful, Iliana! I love your silhouette of the flower and butterfly! fantastic background with the stark black flower and butterfly! What a fun idea on the background!!! Just a great background stamp. It's really pretty in the colors of distress ink you used but it would also look great in more neutral shades for a masculine card. This is a beautiful idea multi stamps on one card and I love how both stamps are equally as impactful playing off each other. I love your card, and the background stamp is great. Love this card! Now there is more to add to my wish list - and still growing with such a great new catalogue! Beautiful card - love the background. What a great background and you did a fabulous job here! Love this background stamp and your technique is awesome! What beautiful results!!! TFS! This card is awesome, I love it! The colors are amazing! Great card...love the background stamp and the way you colored it. Great tutorial. The background with the flower and butterfly is so complimentary. What a gorgeous inky background. Gorgeous! I'm really taken with that butterfly set! This is gorgeous!! Love the color combo you used. Wow! Just wow. Those are all my words. I'm in love with this card. I love distress inks and bright colors. I love that newspaper background stamp and I love beuuterflies .You grabbed me with this one. Very unique! I love the mixed media look of this. Gorgeous background. Love the description of how it was created. This is making me want to get the newspaper background stamp now. Very Creative. Wow! This card is simply stunning!!! I like this unique and pretty background. Beautiful blend of colors. Love this card! The colors on the background are great. I never would of thought to use such pretty spring colors!Newspaper means neutral I love the out of the box thinking. Gorgeous card! I really appreciate the tip of letting the MISTI slam onto the paper to get the droplets look. I love your background, and the bold colors you used are perfect with the Hero Arts NEWSPAPER Bold Print… Very cute! I love the way you used the butterfly and flower as a silhouette against the bright, vibrant background! This does look like a fun card. Oh, WoW! I never would have thought to do the newspaper in such gorgeous bold colors! It's fabulous! Thanks for helping me to think outside the box!! Cool card! Those colors with the newspaper background look amazing! Wow Iliana this card is amazing. I like the newsprint background and the gorgeous colours of ink you've used. The silhouette butterfly and flower are perfect. Thanks for sharing your tips and great video on how it was made. Wonderful card using that newspaper background stamp! Beautiful card! 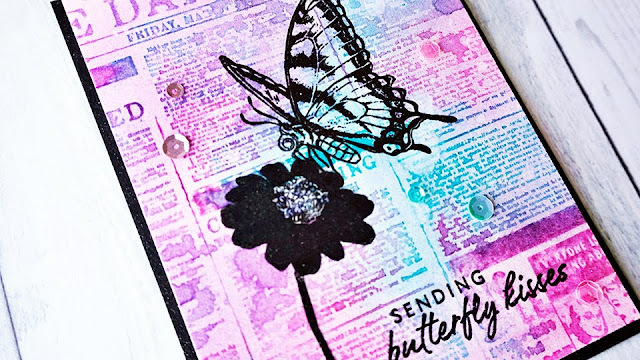 That news print stamp is a great background stamp and I love that butterfly stamp. it's so pretty! Thank you for sharing with us! Such a pretty card just love those colour combo you used, and the background is awesome with the newspaper look. Wow! That was awesome! I love your card. I am really drawn to that newsprint stamp, and you used it beautifully. It is definitely going on my wish list. TFS. Such a great card! LOVE the background you created! Beautiful card, love the Newsprint stamp and color combo! This is just gorgeous! Great job on it! Love that background! So pretty. Love the bold black butterfly on the softer background! What a bold and vivacious card. The colors look stunning against the black images. Such a beautiful card. I love the unique background. Beautiful card. I love the background stamp and how you used it. Thanks for sharing.. Thanks for the excellent video. I think the multiple stamping and embossing made the images really shine. OMG! your background is AMAZING! Those colors really make the black image stand out! TFS! The background is stunning, perfect for this lovely butterfly stamp. Thank you for sharing! Lovely card! I'm going to have to try this technique. Thanks for the inspiration! Love the unique background & the awesome stamps! Wonderful card! lovely colourful background, an unusual and pretty take on newsprint. Very fun and colorful background! Stunning background, love using multicolors with the newsprint stamp. That butterfly stamp is one of my favorites in the new catalogue. Love how you used it on the inked and stamped background. Gorgeous card! I love that card! The newspaper background is fun, and the images are good. I really love that butterfly! Great job. Wow, fantastic card! I love the vibrant colors of the background but it still lets the focal point shine. Love your ideas. They are so creative and feel like one of a kind...thanks for sharing! Beautiful card! I could see stamping a lot of these backgrounds in various ways/colors & creating a bunch of cards later with them!! Fabulous card! I love your color choices. Gorgeous! Love that background! I was thinking "I wish she would have done a video" and there it was at the bottom. Thanks!! Love your fabulous card! Thanks for the tip on "slamming" the Misti cover down! A great technique that worked beautifully! Love that watercolour background! Really lovely! That background looks fantastic! Great tip about letting the MISTI door slam! VERY pretty. Love your colour combination. What a fantastic card! The colours you used are awesome! 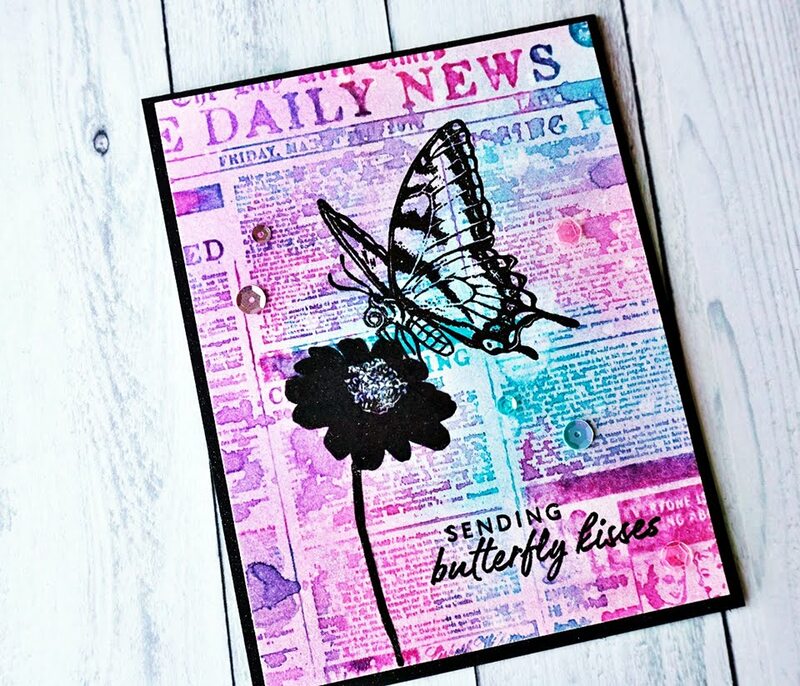 I love the multicolor newsprint background with the black-and-white butterfly. Such a fun switch of how one would see it in nature! And the card turned out just beautifully. Thank you so much for sharing! Fabulous background stamping! I love the bright colors you used! This is a fantastic card! Beautiful..Love the background so much..Awesome colours. Love what you’ve done with the background stamp. It is very pretty. The silhouette flower and butterfly stamped images are perfect up against it. This newsprint background stamp is amazing but I love the colours used to stamp it. So cheery. And then the black main image just pops against it. Absolutely gorgeous!! One of my favourites from this hop! This card is so pretty!! I love that butterfly. The background is so pretty. Great watercolor and silhouette technique! Can't wait to try! Love this new catalog! Thanks to all! I will use your technique of closing the Misti door to get a splatter effect. And that newsprint background stamp is on my list to buy! Thank You! Ah what a clever background! I would not have thought to make newspaper so colorful, it looks great. This background looks amazing in watercolour. Great card! I love the black silhouette on the bright background! This is awesome! What a great idea to do the background, with the gorgeous Hero Arts Newspaper stamp,in colour instead of black. The Hero Arts Swallowtail stamp is one of my favorites from this release, its so versatile. Thanks for the informative video. Fantastic card! I love that background! What a clever use of a background stamp, love this card!